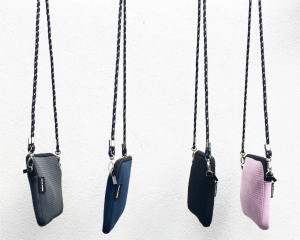 Muddy says: a stylish bag made from neoprene of all things – wetsuit material! These stylish bags are machine washable so make ideal gym or beach bags as they’ll deal with wet floors, muddy sand and leaking bottles. They have recently moved into the clothing line with the new Prene sweatshirt. The Prene brand was created and developed in Melbourne, Australia, and their original tote bag rapidly became the ‘it’ bag throughout the country. Such a success, Prene has now expanded worldwide and has just hit the UK shores. Made from neoprene, the bags are lightweight, stylish and versatile. Available in a tote, cross the body bag and backpack there is a style for all occasions. 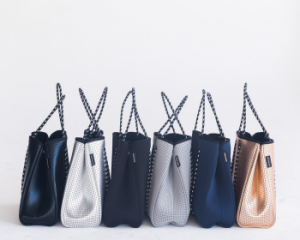 Practical for either for work or leisure Prene has tapped into the sports luxe market as well as the yummy mummy brigade (they are ideal as a nappy bag with the optional bag organiser) they are just great for everyday use as they are machine washable on a cool wash. The original best-selling tote bag is available in 6 colours including the stunning metallic gold version. Each come with a matching pouch inside which is large enough to hold and ipad mini, phone, keys and money. The rucksacks are ideal for festivals and come in metallic black or hot pink. The handy cross the body bags have two interchangeable straps options: either the classic Prene black and white rope option or a plain black adjustable webbed version. Launching in the autumn, Prene will be adding neoprene sweatshirts and even a coat to their range. Keep an eye on the website or follow them on Instagram @prenebagsuk for updates.